With these needs in mind, I added a ton of spices to the dry wheat gluten. 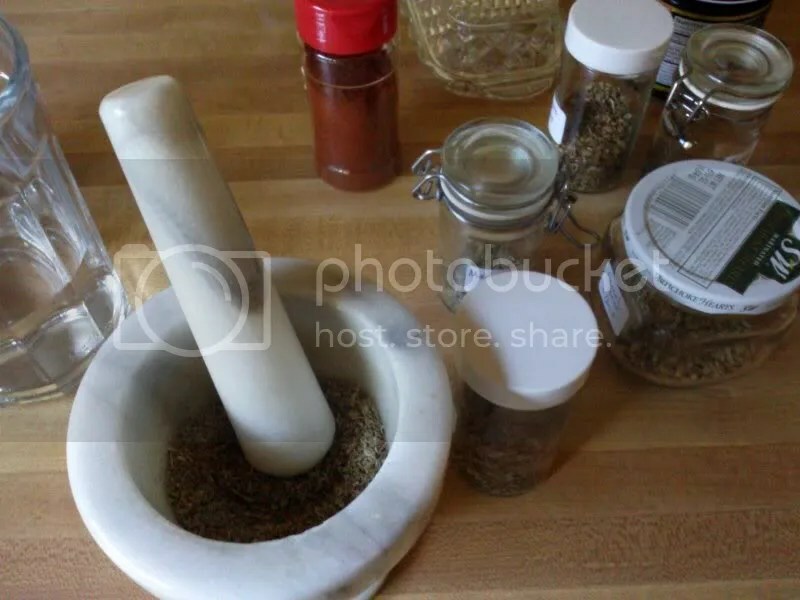 I also ground the spices up in a mortar and pestle. Oregano, basil, marjoram, salt, pepper, fennel seeds, and chipotle pepper (for smoke and heat) were my spices of choice. Do your own darn thing. I was hoping that the small pieces of spice would just absorb into the tissue of the seitan. And I remembered that the whole fennel seeds in the last seitan experiment seemed to cut up the gluten strands. I had seen an Australian youtube video where the cook wrapped the seitan loaf in some cloth to help shape it into a particular form. 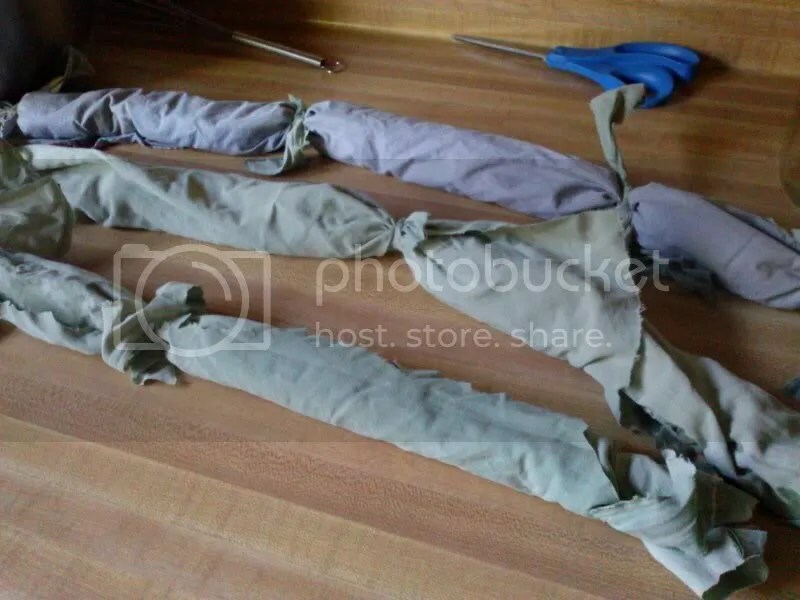 So I chopped up a couple of old pillow cases (well washed). I pressed the cut chunks of kneaded seitan into logs and then wrapped them tightly and tied off between each link. I cooked the wrapped sietan links for about 45 minutes in stock that was just short of boiling. The addition of ground up spices seems to have flavored up the seitan. Kneading the seitan until quite firm seems to have toughened up the dough and the final project. Within a few seconds I could see that the cloth wrapping was billowing around . . . 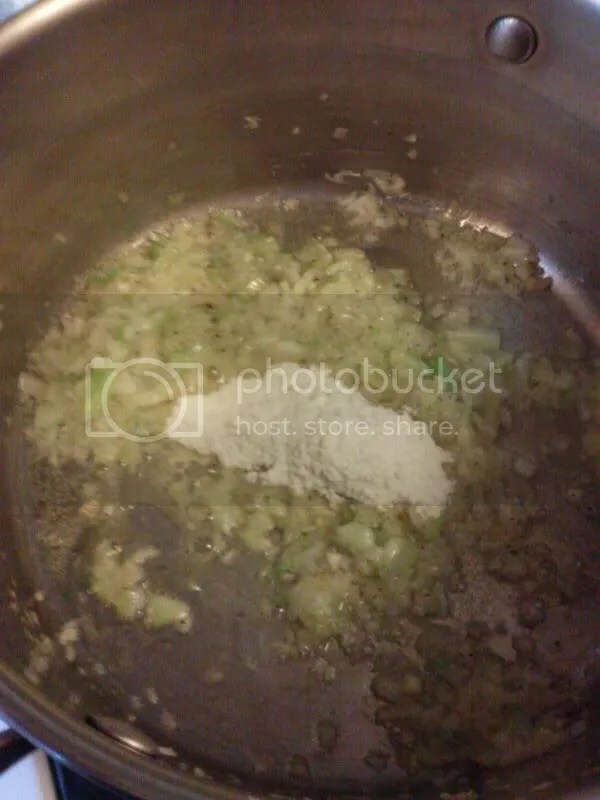 I think I could have just dumped the links into the broth without bothering to use the cloth. I also had mild chemical fears about halfway through the process . . . afraid that some dye would get into my food. Next time I’m going to knead even more and increase the salt in the broth. But it is pretty dang good. And nice to have vegetarian Italian sausage hanging around for meal prep. Keep eating and experimenting party people! 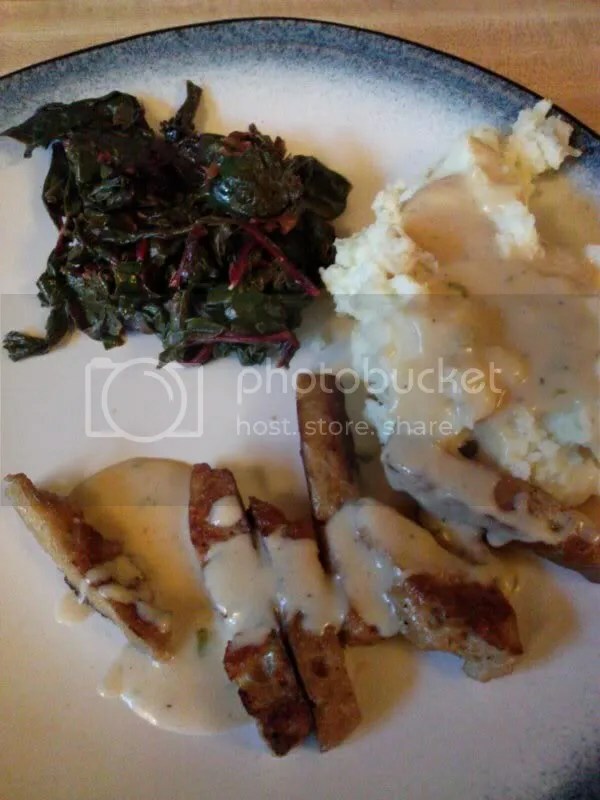 Swiss chard, mashed potatoes, fried seitan and vegetarian gravy. Everything is Humboldt locally grown except the flour. The life of refinement is about making things better. It takes practice for most of us to get good at the things we want to do. It requires that we try and try again in order to achieve our goals. So I’m back in the flour aisle of the health food store looking for vital wheat gluten to make seitan. There are thousands of flours that have the gluten removed, but only one brand of wheat gluten. Casual evidence that the anti-gluten side is winning in the gluten vs. non-gluten wars. For the second time around I pick up up some Bob’s Red Mill vital wheat gluten. I don’t usually promote any brands on this website, but I think Bob’s is a fairly positive corporation, and the dude gave his flour factory to the workers. Not to mention if you are out in the boonies and don’t have access to a local health food store to buy vital wheat gluten, Bob’s will mail you a bag. 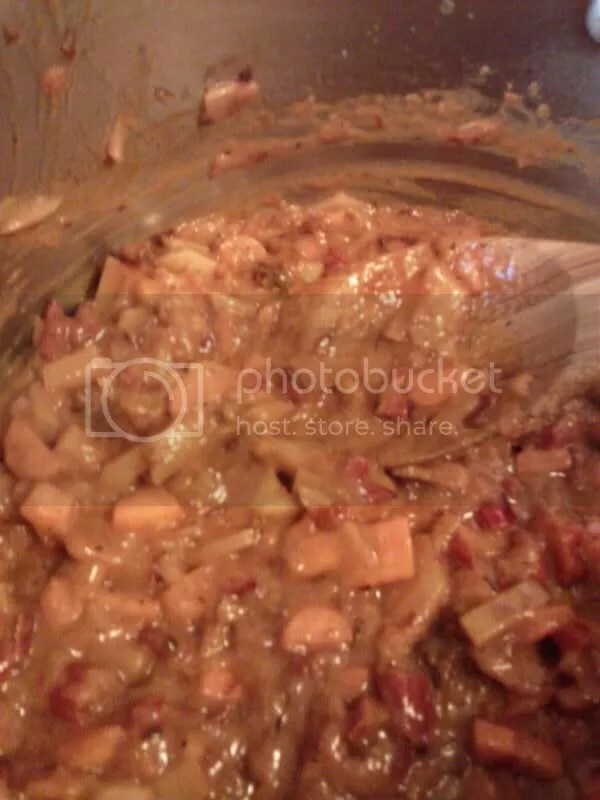 The basis of my stock is usually a browned fond — onions, oil and flour. Cook the three on a lowish heat with regular stirring to ensure that it doesn’t burn. As I added vegetables for the stock, I cooked it down with a little white wine each time, reducing and then browning each time. Thinly sliced carrots, cooked down until the pan was browning and then douse with white wine. Then I added a couple local potatoes (chopped with skins! ), browned and then added more wine. Repeat with chard stalks, and then I added oregano, thyme, salt, pepper, chili powder (personal preference), and some chili flakes. What you get is a thick goo — a seasoned foundation for a vegetable stock. I added water to almost an inch of the pot. Dropped a giant frozen nub of ginger into the soup, and added some soy sauce and a spoon of miso to taste. I let it sit for a while, just simmering while I made the seitan. Last time I felt like the dough came together too quickly and not all the flour got moist at the same time. The seitan was tough, and I knew I wanted a more loose dough. I wasn’t sure if the broth I added to the seitan was too hot or if didn’t add enough broth at one time. So this time I put the flour in a wide bowl, added recommended herbs from the package and stirred the whole thing gently with a whisk. Concerned that the stock might have been too hot last time (potentially cooking the dough strands into seitan before kneading), I chilled two cups of stock. This time when I added the cool broth, the seitan was a joyous mass of juicy chewy-ness within seconds. I made sure everything was moist and stirred together and let it rest for ten minutes. I’ll acknowledge my chief conspirator in this experiment, my sweetie who happens to be an artisan bread baker. With decades of dough experience, I asked her to knead the seitan. 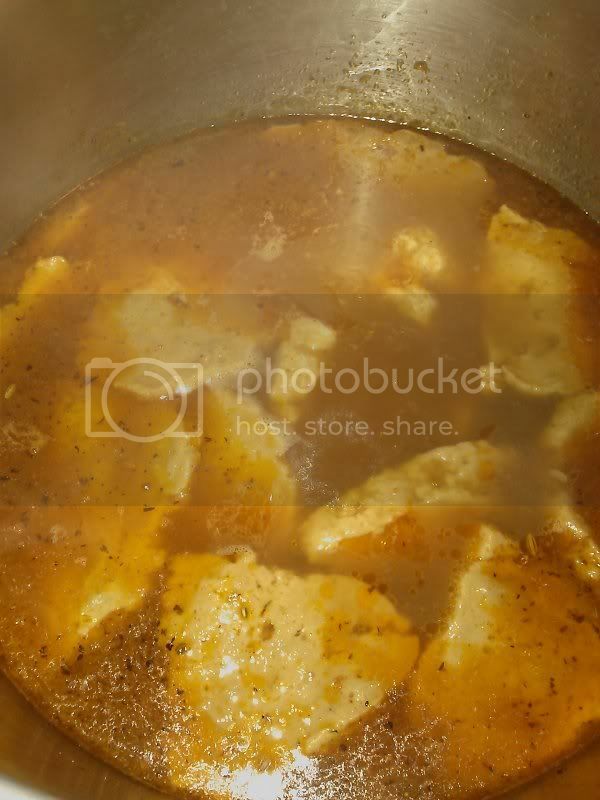 I strained the stock and after a quick rest (another ten minutes), I chopped up the dough into slices and slipped it into the simmering broth. I let it cook for an hour or so, and then shut it off. The result was pretty tasty. The seitan is tasty by itself, rich with the broth and a little taste of flour. 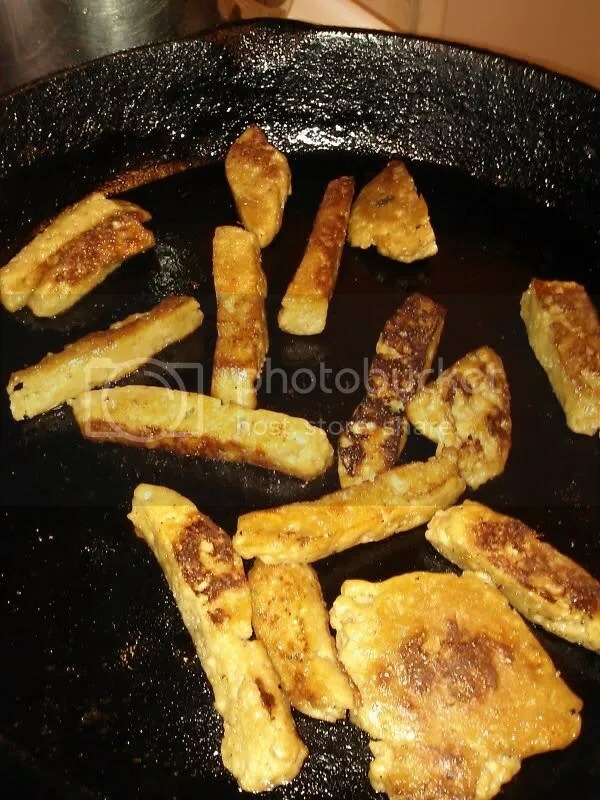 This seitan is wonderful to fry, staying moist inside while getting a crispy exterior. Next experiment is to try to bread and deep fry seitan — make a nugget so good that I don’t want to share it with other people. I got inspired to make my own Sauerkraut and batch one was fantastic. I simply chopped up an organic cabbage, sprinkled with a little salt (less than a teaspoon), mashed it up and then stuffed it into a breathable jug. In a little less than a week there were nice bacteria bubbles and a healthy sour smell. 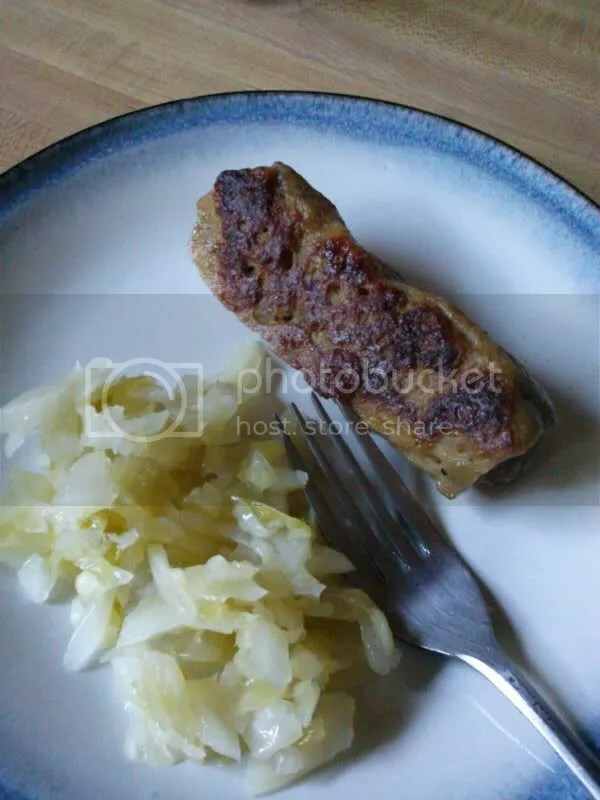 I like my sauerkraut to taste like steamed cabbage sprinkled with fresh lemon — a delicate and sweet flavor. 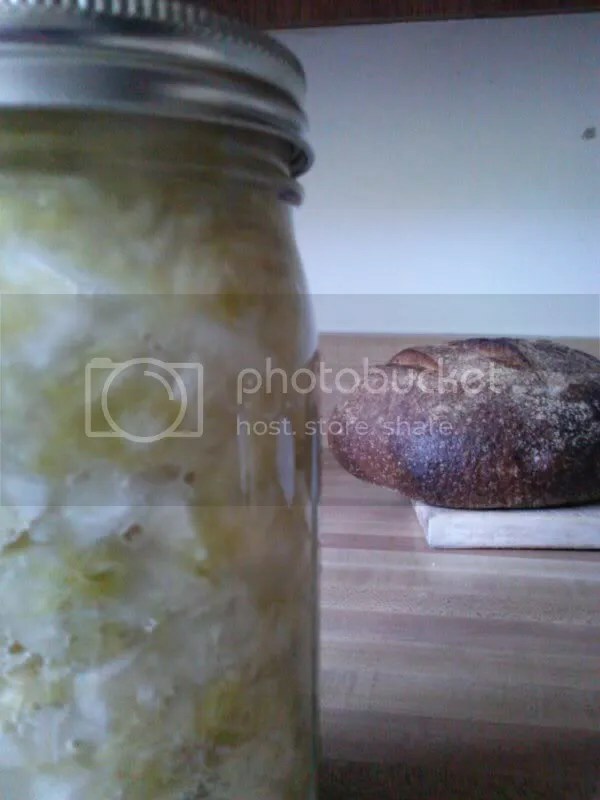 When it reached critical mass, I jammed the kraut into some jars and put it in the fridge. The ultimate plan was to make my own vegetarian spicy sausage to go with this finest of condiments. It has been a long time since I made seitan, but it was exceptionally easy. I made a nice stock (carrots, onions, garlic, spices, veggie broth and some leftover veggies from old meals), mixed up the vital wheat gluten with chili flakes and fennel seeds, added liquid and then kneaded the seitan. It came together so fast that some parts of the mix didn’t get hydrated well. Sliced into slabs and then into the broth. I’m also realizing that my broth might have been too hot. But some of the seitan came out firm and some was jiggly perfect. But it was not, sausage-like. What I had was a kind of firm beef-like substance, not quite what I was intending. When life toughens your seitan, you make barbecue! Sautee the onions and garlic at a low heat. Add all the spices and let it all soften. Add wet ingredients to taste and keep stirring. Once you have a healthy barbecue sauce going, add in thinly sliced seitan and stir. I let the whole thing cook for a few minutes to warm the seitan. Served on thinly sliced bread open face.